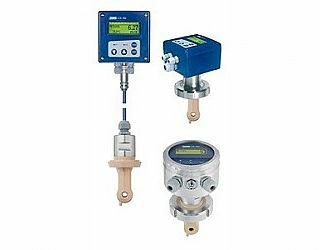 The device is used for measurement / control of the conductivity / concentration of fluid medium. The application is particularly recommended in medium, in which severe deposits by soiling, oil, grease or gypsum and calcium carbonate precipitations are to be expected. The integrated temperature measurement allows a precise and quick temperature compensation that is particularly important when measuring the conductivity. Additional functions, such as e.g. the combined toggling of measuring range and temperature coefficient allow the optimum use in CIP processes. Two integrated switching outputs can be programmed freely for limit value monitoring of conductivity / concentration and / or temperature. Furthermore, alarm and control tasks (desalination) can be assigned. Operation is carried out either via keypad and plain text graphical display (operating language can be toggled) or via a comfortable PC setup program. The display is visible by simply turning the case cover when installed in either vertically or horizontally routed pipework. The setup program can also be used to store and print out the device configuration data for machine documentation. To exclude tampering, the device can also be supplied without keypad / display. In this case, the setup program is required for programming. Depending on the requirements, there is the choice of either a plastic or a stainless steel case. 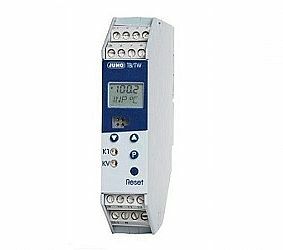 The JUMO CTI-750 can be supplied as a combination device (transmitter and measuring cell in one device) or as a version with cable-connected transmitter and measuring cell. The separated version is especially suited for systems subject to strong vibration and/or strong temperature radiation at the measuring location or for installation at locations that are difficult to access.